What I got, however, was something quite different. This book is enormous. It looks like a textbook -- about 8.5"x11", glossy hard cover, and 342 pages. Wow. I thought this was a book that I would sit down and read myself. You know, over a couple of weeks. I was clearly quite wrong. So, I settled in to read the introduction and forward and to rethink how I would review this. That led to my discovery that Boyer has created an Activity Book to go along with the book (a free download), and that convinced me that I can actually use this title with my kids. I read through a few of the bios on the signers in an effort to figure out how to do this with my kids. And it is pretty easy to get sucked into just reading. Fascinating people, and I know NOTHING about the vast majority of them. How many signers can you name? John Hancock, of course. Benjamin Franklin. Thomas Jefferson. Benjamin Rush. And I was pretty sure that John Adams and Samuel Adams were on this list (they are). That means I knew of six. That puts me above average (according to the introduction, most people can name three or fewer), but still... that's FIFTY names I don't know. We are going to study one person per week, which is one of the suggestions they make for using the book. From the Activity Book, I will print the coloring page (a portrait of the individual) for whoever wants one. The kids can color that as I read the chapter. Each chapter is roughly 4-5 pages of text. I'll confess that even with the coloring page, it is too much for my 4 year old, and probably too much for my 1st grader as well (he's tuning out the final page or so). At the end of each chapter are some questions. Some of these made us go back through the text to answer ("What qualities did William Ellery observe in Josiah Bartlett?" -- uhh, WHO was Ellery??? ), others led to interesting discussion ("Look up the definition of enthusiasm. How did this characterize Bartlett's life?") and still others I just chose to skip over. The Activity Book also includes a page for each signer listing their name and state, a character quality and definition, and a Bible verse. For Josiah Bartlett, the character quality is enthusiasm (which is obvious from the questions above), and the Bible verse is Colossians 3:23. We are printing these sheets out to hang up for the week, alongside the portrait coloring pages. The Activity Book also includes 27 Family Fun Quizzes. The first one is to be completed after all the New Hampshire signers (3 of them). We'll try that, maybe turning it into some type of a Jeopardy-style game. I'm not sure we'll use this part though. Overall, I think this is going to continue to be a fantastic part of our school week. 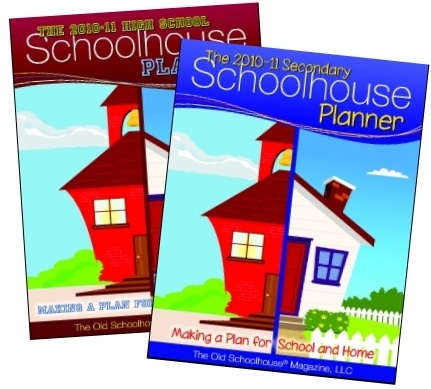 Why am I excited about the new Student Planners that The Old Schoolhouse has just released? Well, I have spent a fair amount of time in the past year trying to get something to work Connor, who has started doing high school work. That has convinced me that I want to find a system for my younger children too. When I've looked for a planner for him, I have encountered a number of problems. Most planners definitely target a traditional school student. While that helps with some of his online courses, it is nearly impossible to stuff most of our learning lifestyle into that type of a format. 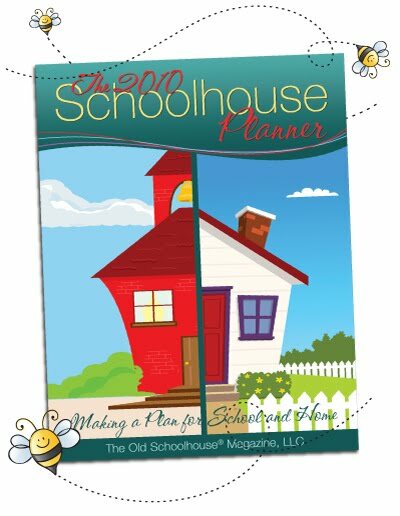 Or, if the planner is meant for homeschoolers, it still makes a number of assumptions, such as a traditional school year, or a 36-week schedule with clear semester and quarter breaks. Our life is not so neatly compartmentalized. The other big thing lacking for my family is a place to track some of those idiosyncratic courses that my children want to create. They need a place to jot down ideas about someone who might talk with them about what genetic research is really like, or the forensics book that has a great chapter on entomology. Be flexible, allowing us to date the pages ourselves and to choose what pages we want. And especially for my boys, to not have a whole bunch of unused printed forms, so when they take their planner to Scouts, there aren't extra pages getting in their way. Pages that can be used to track things for Scouts, and not just for school, would be an added bonus. Encourage initiative and responsibility, allowing my students to plan out their own courses, track their own reading logs, along with the normal things like creating to-do lists and scheduling their time. Be interactive, as my children would rather do it on the computer than have to use a pencil. Being able to save their changes as they go, and print when they want to would be even better. The Old Schoolhouse Student Planners do all of that. And more. Like articles written to the student, targeted to their age range. There are pages of information about Newberry Award Winners or the periodic table. There is a separate pdf file for the parents to help them learn to schedule their time and to use this new tool. What I love is that the High School Planner is going to be equally usable for my ambitious and definitely college-bound son and for the one who is more entrepreneurial and does not think higher education is something he wants to pursue. One will have the college admissions checklists printed out. One is going to have a lot more "create your own course" pages with notes about internships and possible mentors. Of course, for this year, each of us will have a completely different planner. 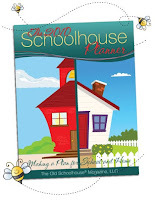 I get the regular Schoolhouse Planner. One thing I really love is that I can save multiple copies of it. So I am using the calendar pages to plan out my blog posts in one file, and that doesn't get cluttered with all the other things I have going on in my life. I have my regular one as well, and that one includes all kinds of great information on what we are doing in school. Connor will have the High School Planner and will be busy plotting out his 4 year schedule and noting prerequisites for various career choices. He will have pages and pages of Science Lab Sheets. And he now has a start on some important "stuff" with a sheet filled with phone numbers and addresses for important people. This page alone is worth it to me. I know they all have the phone number for the doctor now. William will have the Middle School Planner, complete with Unit Study Planning Sheets and various Goal Sheets. He will particularly love being able to type information into his forms. Thomas will have the Secondary Planner, and will use far fewer forms than his big brothers. But that will include things like Book Reports, and Memorization Records. Richard will have the Primary Planner. As a first grader, I'm not totally convinced he truly needs one. He will want to be like his brothers, and there are some fantastic Journal Pages and Chore Charts, and I really think this will help him to build some great habits so that he will have an easier time with the older planners as he grows. It's been insanely busy. Again. Still. I've been sadly neglecting my blog. So, it's time for another mish-mash post. William and Thomas are taking part in Peak Reader, a literacy program in town. I feel like a totally inept mother who can't even teach her kids to read. <sigh> But I'm forcing myself to deal with it and get them some outside accountability. Thomas really hit it off with his tutor. William was being contrary. He started debating the existence of the Loch Ness Monster with her, and whether or not it is a dinosaur. <sigh> I hope tomorrow goes better. We have a new roof. It is amazing. I love not worrying about rain. I can't begin to tell you how much I love not worrying about rain. I'm tired of stupid politics between people who are supposed to be adults. The kids got a scholarship for swim lessons. I cannot imagine what we'd do without this. They really do need the lessons. A couple of boys drowning here locally brought that fact home for me. I have way too many books sitting around to be reviewed. My review week last week was pretty much a failure. I need to buckle down and get some things done. I can't seem to settle into a routine for school this year. I'm seriously considering a homeschool enrichment program next year for the kids. One that would give them a lot of things -- like a weekly technology class, and an art class, and some PE opportunities. I also picked up information about 4-H. It is very tempting to get all four boys signed up for that. There's an informational meeting happening next week. I think we are going to go. And Trina could join next year. We're loving the writing program that we are reviewing for the TOS Crew. The Write Foundation. I think I may have finally figured out exactly what I need for Connor *right now*. I need to get some things DONE. Complete, over, out of my way. And I still cannot believe we are actually on track to finish the Bible in 90 days... or maybe 91 days. We'll have to see. This weekend for sure though. Bible in 90 Days Challenge, post regarding days 78-84. Here's last week's check in. We are getting closer to being on track. I cannot believe this whole thing is supposed to be over in a few short days. This week, we listened to the rest of Matthew, plus Mark, Luke, John, and the first 11 chapters of Acts. It was fascinating listening to the gospels back to back like that. It was a great week of listening. My kids were having a lot of fun talking about some of the little changes in details between the gospel accounts, and Connor was really interested in who wrote each of the gospels and why... and how that impacted what they wrote. I'll confess -- that did slow us down a bit. I think his writing class had something to do with that -- they've been pushing that you can't understand a work if you don't understand where the author is coming from. That was something I was glad to see, so we did detour a little bit. ESV Study Bible on Logos to the rescue! We've got almost exactly ten hours of listening to go. Over six days, I think that means about 1:40 per day. Though what is probably actually going to happen is that we'll listen to more like 2-3 hours tomorrow, as we are heading in to town for a homeschooling thing at the library, and then rather than come home to listen to pounding on the roof (I HOPE! ), we'll hang out, go to Scouts, and head home. Go here to see what others are saying. One of the best parts of being on the Homeschool Crew is the chance to learn a bit about companies I had never heard of. Salem Ridge Press is an intriguing one. Founded by a homeschool graduate, the goal of Salem Ridge Press "is to be a blessing to others by providing reading material that fits the qualifications outlined in the Bible." Salem Ridge Press is republishing old books, but adding their own special touches. My favorite aspect of their books are the vocabulary words included at the bottom of many of the pages. Typically, these are defining archaic words or phrases, such as "wattled" or "trench upon." I love that I can give my kids a really quick definition as we go, as I hate to break up the story to go look words up, and I often feel guilty that we aren't expanding our vocabularies as much as we ought to be since I don't. 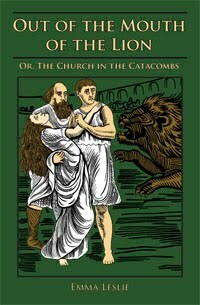 Out of the Mouth of the Lion: or The Church in the Catacombs by Emma Leslie, which takes place around 163 AD, throughout Asia Minor. We did not read this one, but we will. This is the one we received as a soft-cover book, which retails for $14.95. Recommended for ages 12+, as are the two e-books I received. This book is part of a twelve volume Church History series, as is the next title. The series covers events from 59-1522 AD. There is also a five volume Junior Church History series, also by Emma Leslie. Some of my crewmates received titles in that series. 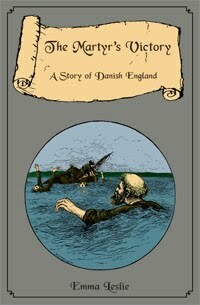 The Martyr's Victory: A Story of Danish England, also by Emma Leslie, takes place around 880 AD. I read part of this story myself, and really did enjoy the writing style. I was a bit taken aback, however, by a statement in the introduction where the author is basically apologizing for making a monk the hero of her story. Looking a little closer, I see this was originally published in 1886 by the Religious Tract Society. I didn't notice an anti-Catholic sentiment in the story itself, just in the introduction. But the introduction was enough for me to want to read the story myself before I hand it to my kids. I did read more about Emma Leslie, and this series. One of the things mentioned is that the series is written from a "Reformed perspective - Throughout the series the characters learn to look to the Word of God as their only guide rather than relying on the traditions of men." What I'm trying to figure out before I just hand the books over to my children, is whether this is truly written from a "Reformed perspective" or whether it is mostly written from an "anti-everything else (especially Roman Catholic) perspective." From what I have read, we probably will read this aloud. One thing I loved with this title was that in the beginning, there was a list of the primary historical characters with a brief bio for each. There was also a timeline. I truly appreciate having that information readily available, as my kids are forever asking who is real and who is not when we read historical fiction. The list also makes it easy for me to assign my teen to go do a bit of research before we begin the story. 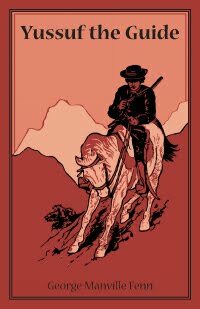 Yussuf, the Guide by George Manville Fenn. The subtitle goes on forever: Being the Strange Story of the Travels in Asia Minor of Burne the Lawyer, Preston the Professor, and Lawrence the Sick. Isn't that just great? This is the story my children picked for us to read aloud. And we have loved it. Ancient ruins? That got the attention of my budding archaeologist. An absent-minded professor? He became a favorite character from the instant he was mentioned. Robbers, snakes, evil captains? Yeah, that kept the attention of my boys. We thoroughly enjoyed this book, or at least my 9, 11 and 13 year olds did. The 6 and 4 year olds wandered away or said it was "boring." I am very impressed with the work that Salem Ridge Press is doing. We love reading in this house, particularly historical fiction. So a company that is making some of the older titles available is pretty exciting. I love the idea of having books that are not going to include gratuitous romance, you know, just so I don't have to hear one of the boys ask, "Do we have to read the kissing parts?" in his best Fred Savage voice. Disclaimer: As part of the TOS Homeschool Review Crew, I did receive one book and two e-books free from Salem Ridge Press. The fact that I received complimentary products does not guarantee a favorable review. It does guarantee a review. A fair review. But I am not going to praise something unless I think it deserves the praise. If I don't like it, you'll hear that. And hopefully with enough detail as to why so you can decide for yourself if what I hate about it makes it perfect for your family. For more about my take on reviews, visit my blog post here. The Creation Story for Children by Helen and David Haidle. What a fantastic book. detailed pictures. Lots and lots of details. The cover gives you an idea as to what the page on the creation of animals looks like. each spread in the first part of the book contains about three verses from Genesis 1 and 2. In total, it is all but four verses of Genesis 1, and four verses from Genesis 2. The Bible is quoted in King James Version, which isn't my favorite version, but it isn't modernized or dumbed-down. The commentary that follows the scripture is also not dumbed down. On the animals page, for instance, the text talks about how animals move ("stomp, hop run, jump, crawl, walk, and swim"). And it talks about the thousands of animals and a million kinds of insects. The second section of the book consists of a paragraph or two of information on twenty amazing creatures. Packed with facts, even my big kids (up to age 13) enjoyed these few pages. The final section of the book takes you through Psalm 139.
detailed pictures. Lots and lots of details. Lots of stuff to tell me about. Lots of things to ask about. The commentary that follows the scripture often asks questions that give her a new way to interact with the pictures. detailed pictures. But you had guessed that already. The scripture doesn't sound like it is for babies. He's a big boy, and doesn't want to be talked down to. The commentary following the scripture doesn't insult his intelligence either. Very important. The twenty amazing creatures, oh, yeah. He can't say enough good things about that section. They don't get bored reading a page or two aloud to their younger siblings. The twenty amazing creatures have so many awesome trivia type facts. Yeah. They like that. What don't we like? Hmmm. Not coming up with anything, other than not quite being sure how the Psalm section at the end is supposed to tie in to the rest of the book. It was lovely, but it just wasn't what we expected in those final pages. Bible in 90 Days Challenge, post regarding days 64-70. Here's last week's check in. Okay, so here we are, trying to get back on track. Monday: Read Daniel. Determined that we are going to do some type of kid/teen study of this book. Kids had to watch Rack, Shack and Benny, and whichever Veggie Tales title it is that includes Daniel in the Lion's Den. Tuesday: Read Hosea. Another tough one to listen to with the kids. Read Joel. Wednesday: Read Amos. Read Obadiah. Read Jonah. The kids pulled the Veggie Tales movie out, but I haven't let them watch it yet. Will do a second Bible session this afternoon. Read Micah. Read Nahum. I think we'll finish the Old Testament tomorrow. It was fun listening for prophecies about Jesus. Sunday: Yeah. We cannot get this done when Dale is home. Anyway, today we listened to the first five chapters of Matthew. Since my iPod vanished yesterday, we had to improvise in order to hear properly. My computer speakers are, um, not loud. Without the abiltiy to listen in the car, I'm not sure if we are going to be able to pull off these last two weeks. Thirteen days left. Twenty hours of listening left. That's a bit over 1.5 hours per day. We should be able to do that on days we stay home. To Kill a Mockingbird, by Harper Lee, is a book I've looked forward to sharing with my children. It is actually part of Sonlight Core 100 (American history at a high school level), so Connor will be reading it next year. When I saw, The Mockingbird Parables by Matt Litton, and read a bit about him and the book, I knew I wanted to read it to prepare for deeper discussions with my boys. Litton starts the book off by telling us about his background with To Kill a Mockingbird, and the first time he heard the story. How it captivated him, and how he has returned to the novel again and again, and how he currently returns to it with his students year after year. How as he got older, he started seeing far more spiritual significance in the story. And those spiritual stories -- parables -- are what led to this book. You can see that Litton is covering a lot of ground with the stories he pulls from the book. He talks about the scenes from To Kill a Mockingbird with great familiarity -- if you haven't read it, or don't remember much from your high school English class, you might want to re-read the novel first. how how this "felt" -- you know, what you get out of the book is going to change with time and life experiences. This has made me really anxious to get a bit further in our studies so I can have conversations with Connor. Questions in the study guide in the back include ones like "How can we learn more about God and ourselves by spending time outdoors?" or "How does your faith affect or transform our definition of courage?" I enjoyed this book. It was a pretty easy read, which I needed after some of the fairly intense stuff I've been reading lately. Maybe a bit too easy, actually. Much of the scripture quotations use The Message, which is not my favorite version of the Bible, or even one I generally consider acceptable. (He does also quote the NIV, NASB, and NKJV.) In spite of being easy to read, it still challenged me -- am I a positive influence on my society? I have to get my list knocked down a bit. I just have to. We'll see if I follow through on all of this, or maybe I'll substitute some. But that is my plan! Even getting 4-5 done and posted would make me feel better. Blog cruise time again this week! "What are your favorite resources for the ages and grades that you are teaching?" is the Blog Cruise question(s) this week. Okay, so let me start by saying that I'm teaching everything from PreK to high school, and since Connor is doing CLEP stuff, I guess really it is through college. Can't figure out how to organize this. I think I will go through ages and stages. And I will try to link at least most of these, but I'm not sure I have the time. And I'm only listing things once... the first time it seems appropriate. The Old Schoolhouse. Love the magazine, love their emails, love the Schoolhouse Expo. And I learn about all kinds of really neat things through them. The TOS Homeschool Crew blog. I liked this even before I was on the crew. There are so many interesting homeschooling companies on there, and the chance to link to bunches and bunches of reviews from people with all kinds of perspectives. And the reviews tend to be real. Not all glowing ones, and honestly, I am usually most swayed by a well-written "negative" review. Knowing what DID NOT work about a program for a family does so much for me. Plus the blog has all kinds of fantastic giveaways. I'm not eligible to win, but maybe you are! Latin-Centered Curriculum, by Andrew Campbell. I think this is a great read even if you have no intention of teaching classically, or of teaching Latin. One of his primary messages has to do with trying to do too much. Instead, he advises slowing down and really doing a few things really, really well. Going deep, not wide. Sonlight. We are a literature-rich homeschooling family. Finding Sonlight at a convention eleven years ago is probably a huge part of why we actually did start homeschooling. I love using real books, I love exposing my kids to alternate points of view. I've used Sonlight from PreK (there are new preschool levels now) through Core 6, and we are using Core 7 this year. I can't recommend Sonlight's high school levels (yet) as I haven't used them, and they are different from the earlier materials. All About Spelling. I cannot say enough good things about this program, and it keeps getting better. I think this could be the answer for nearly anyone who actually needs a spelling program. And it has done wonders for my younger kids in learning to read too. You can read more about my thoughts on their stuff: In general, Levels 1 and 2, the Beehive Reader, the What Am I? reader, All About Homophones. (Do you get the feeling I like this?) I think this can be started in late preschool, or it can be started much later. I've done both. Download N Go unit studies. I cannot believe I finally found some unit studies that I like! These are one week studies on really interesting topics that get in pretty deep. Lots of web-based links, including great videos, plus book recommendations, hands-on suggestions, lapbook starters... use what appeals to you. Mathtacular. Oh, wow, what excellent videos. Love 'em. My kids love them. There is supposed to be a 4th volume coming soon. I can't wait. Cub Scouts: Oh, I'm telling you, we have had the chance to explore so many amazing things through scouting. I think the BSA has done a fabulous job of putting together things that a "good family" just ought to be doing anyway. For cubs, that includes learning age-appropriate first aid, learning about safety issues, and doing a variety of great things including library visits, news room visits, putting things together, picking up trash... If I don't find a suitable organization for Trina starting in first grade, I will be using the appropriate level of Cub scout books to structure things like visiting the fire station. At roughly $10 per book, I think these are nearly worth their weight in gold. Tiger=1st grade, Wolf=2nd grade, Bear=3rd grade, Webelos=4th/5th grade. Institute for Excellence in Writing. Great, great, great stuff for my reluctant writers. Great stuff all the way through high school. Wish I could afford more of it. iLiveMath apps for my iPod Touch. Love that my younger students can use them too, but really like the "level 3" portions of the programs. I reviewed a couple of their products a couple weeks ago, and will be doing more sometime soon. Games. I like BigFishGames. Some are actually educational as such (Amazing Brain Train is one of my favorites). Some I like because my reluctant reader kiddos are forced to read in order to know what to do. Some I like because of the geography incorporated. Or the thinking skills. Boy Scouts of America. Okay, I could have put this in Late Elementary too, as boys can join as early as mid-5th grade. But in addition to all the things I love about BSA as far as activities and camping... why I put them on my list here is mostly for the Merit Badge books. There are somewhere around 125 merit badges right now, and they have $4 books to go with them. Many, many of these merit badge booklets make amazing little textbooks. Okay, some are for things like basketweaving (basketry, actually). But there is a great civics set (Citizenship in the Community, Citizenship in the Nation, Citizenship in the World). And there are lots of science ones (from Chemistry to Nuclear Science, from Archaeology to Insect Study) and every one of the science merit badge books I've looked at has been phenomenal. There are also a lot of career related ones (Law and Dentistry, to name two my sons have earned). And then there are the practical ones -- first aid, swimming, traffic safety, emergency preparedness, home repair, and on and on. Apologia Science. I liked the elementary books, but I love the upper level stuff. We have used, or are using, General Science, Physical Science, Biology and Chemistry. I love how the books "read" like Dr. Wile is speaking right to you. I love that the experiments are things we can do in the home. I LOVE that the books are available on mp3 -- that makes it easier for me to keep on top of what the kids are doing, when I choose to. And it makes it possible for my severely dyslexic kiddo to "do science" at an appropriate level, even though reading the text would be a struggle. He can use the mp3 to "read along" in his textbook. I love that the materials are non-consumable (well, except for some of the lab stuff). Teaching the Classics. Wow. Great, great, great stuff. This is supposed to be a course to teach the teacher how to "do" literature study. I went through the sessions a few years ago, and now am taking my older children through the DVD sessions too. Anything by Lee Binz. Her writings make me feel like I can do this. VideoText Math. We're starting on VideoText Algebra for the second time. I think the step-by-step VIDEO-based approach has been perfect for my family. Expensive, but non-consumable. I keep hoping to be able to afford Geometry, but I don't think it's going to happen. We use this starting in Junior High, but really, it is a high school level. The new student planners put out by The Old Schoolhouse. Of course, I'm biased as I worked on them. But I especially love these for middle school and high school. Love the one for Mom too, by the way. Right NOW is the time to buy the student ones -- the price goes up on Monday or Tuesday. Connor is studying for a couple of CLEP exams, using lesson plans available at ClepPrep. Professor in a Box -- this is a college level accounting course (and a marketing one is supposed to be coming soon), that you can do in high school, and you can use it to prepare for the CLEP in accounting (or marketing, I assume). I reviewed it last year. It was a bit beyond Connor at the time, but I worked through some of it myself. My degree is in Accounting, so I can't say I actually learned anything. Except that this is a solid course and we'll be using it with all the kids. And please... I'd love to know what some of YOUR favorites are! The TOS Crew Blog is sponsoring a question of the week every Tuesday. I cannot begin to tell you how excited I was when I first saw that New Monic Press was one of the Crew vendors this year. 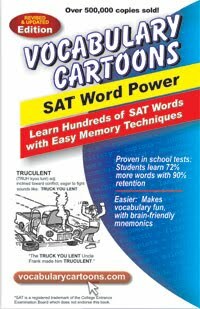 I was almost as excited as when I found out I was on the list and would be getting Vocabulary Cartoons: SAT Word Power from them! This is a product I have had in my cart more than once... at Barnes & Noble, Amazon, Borders... and for whatever reason (mostly because I hadn't actually SEEN it myself), I kept saving it for later and purchasing something else. If you only have time to read a couple of paragraphs, here's my bottom line: the second book was put in my cart at Borders this month... and it stayed there. It arrived Wednesday. I haven't had time to look it over thoroughly, but on first glance, I am as impressed with #2 as I was with #1. I've looked at samples before, and while I liked what I saw, I guess I still didn't quite get it. (I would recommend looking not just at the samples that are actually on the page I linked, but more importantly at the ones you can download.) Apparently, I needed to have the book in my hands... and now that I'm actually using it, well, I'm sold. 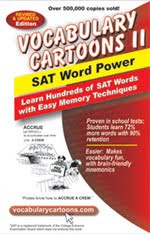 The book contains 290 words, listed alphabetically in 10 word sections. After every ten words, there's a review page. Each individual page consists of the word (let's use FATHOM), pronunciation help (fa THUM), part of speech (v.), and a definition (to understand fully; to penetrate the meaning of). Next is a "link" word, that sounds similar, or rhymes, or something (FAT THUMB). Then is the cartoon, with a caption. In this case, there is a puzzled doctor, looking at a chart, a boy at a table with an ENORMOUS thumb, and a nurse holding an x-ray showing a huge thumb. The caption reads: "Doctors could never FATHOM the reason for Larry's FAT THUMB." The cartoons tend to be like this -- something utterly zany. It sticks that way. The outlandish image is memorable. Her friends thought they had FATHOMED the reason Estelle applied for entrance in an all-boys college: She never had any dates. The jury found it hard to FATHOM how the defendant could commit such a terrible crime. (In nautical terms, FATHOM is six feet of water depth.) We dropped anchor in four FATHOMS of water and made plans to stay for the night. I chose this example page because it gives me a chance to talk about some of what we liked, and some of what you might not find appealing about this book. First, the sample pages on the New Monics site don't give the example sentences, and honestly, that is probably why I never hit purchase. Those sentences make all the difference for me. Okay, so let me talk about how we use this book. Connor is totally capable of reading and understanding this himself, but I want to be sure he is really "owning" the vocabulary. Plus, well, I have a family full of budding etymologists (*and* entomologists, but that's another post!) and they all love doing these too. So I sit down with Connor (and usually everyone else) and we read through the whole page. We talk about what makes the cartoon funny, or stupid, or memorable, and how that can help us remember what the word means. We read and discuss each sentence, particularly including other forms (fathomED above), or alternate definitions. Then we all come up with silly sentences using the word. I'm thinking I'm going to write words on the white board too, and the kids will ALL get bonus points on papers where they are able to appropriately use current vocab words in their work. We continue to point out any of the words we encounter in our life, and we continue to use the words in silly sentences throughout the day. We go through two on Monday, four each on Tuesday and Wednesday, go through them all again on Thursday, and Connor does the review on Friday. What I think works about this is that the cartoons are pretty goofy, so the kids think they are fun and it keeps it interesting... but it is the discussion we are having about the different ways the word is used in sentences that really seems to be making it stick. Another thing I like is shown in sentence 1 above -- they use a lot of more "classic" names. Many are still common (Laura, David), but some are more representative of my grandmother's generation -- or earlier (Norman, Muriel, Wilma). I love having the kids encounter some of these, just to make them a bit more familiar. What I don't like is some of the "teen scene" aspects of some of the sentences... the dating one above, sentences about disliking chores, or ones about weight problems. Though, of course, those sentences are memorable. Fortunately, there aren't an excessive amount of those types of examples. Disclaimer: As part of the TOS Homeschool Review Crew, I did receive a free book from New Monic Press. The fact that I received complimentary products does not guarantee a favorable review. It does guarantee a review. A fair review. But I am not going to praise something unless I think it deserves the praise. If I don't like it, you'll hear that. And hopefully with enough detail as to why so you can decide for yourself if what I hate about it makes it perfect for your family. For more about my take on reviews, visit my blog post here. Oh, wow... what a day. FedEx showed up this morning with TWO packages. One was for Dale and I don't know what it is. 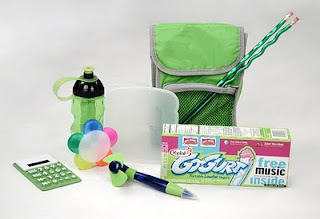 One was from MyBlogSpark, and had a whole bunch of cool lunch types of containers and school supplies... and a coupon for a free box of yogurt. This is something I won from a blog giveaway by my friend Susan at Homeschooling Hearts and Minds. Then the US Mail showed up... with my free for educators DVD based on Joy Hakim's History of US. YAY! And then, the UPS truck showed up. 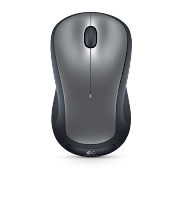 With my incentive for participating in a test quite some time ago... a wireless mouse for my laptop! Oh, I'm so excited to have options besides the trackpad!! I'm way too busy to post any of the stuff rattling around in my head. So while I drink my first cup of coffee this morning, I'm going to babble a couple of minutes about a few of those things. Scout Popcorn -- Uff Da! I don't know what, if anything, we are going to do about popcorn this year. The Cubs (Thomas & Richard), their sister, and myself will be at Safeway twice this weekend, plus once next weekend (Trina shouldn't have to go then though). I think that will be it. Any other sales we do will have to go to William so he can afford to go to camp. Any of my readers interested in buying popcorn from them, or buying popcorn to be sent to US Troops -- let me know. I'm not going to harass anyone. If you are in the area, we'll deliver it. If not, they do have access to online stuff. I'm praying the Cubs do well at Safeway, because we really cannot afford the huge increases in fees. Especially with four scouts in the family. Boy Scouts -- I'm now the mom of a Second Class Scout. William did his Scoutmaster Conference and Board of Review on Monday night. YAY, William! Scout camping -- my three biggest boys (Dale and the two Boy Scouts) are going camping this weekend. Connor chose to stay at base camp and help with advancement goals for his patrol/the troop. He's feeling pretty sad about that after Monday though, as pretty much everyone his age is either hiking or backpacking and their plans sound like so much more fun. I'm proud of him. We just can't get in the groove for school this year. My job ended. I've been working on the new Student Planners for The Old Schoolhouse. Got the final versions last night. Those have taken up a good chunk of time the past couple of weeks, and it feels weird to have it over. Planners are on sale NOW, and will be available Monday, I believe. I started reviewing for New Leaf Publishing. Had a big package waiting when we got back from North Dakota/Minnesota. I am incredibly excited about this. You can see four items from them in my upcoming reviews box on my sidebar. I'm sick of spam comments on my blog, so I turned word verification back on. Sorry... if that doesn't slow the spam down, I'm going to switch to no anonymous comments. I don't have time for 8-10 spam comments a day, I just don't. I'm disappointed with 1-Derful Roofing of Colorado Springs. When they gave me an estimate, they said they could be out here in two weeks. I called them the next day to get the process going, met them the day after that to sign the contract, and was told two to three weeks. It will be three weeks tomorrow, materials have not been delivered, and they are "hoping maybe" to get here before the month is over. Not so wonderful. At least we haven't been getting rain. Would love prayers that it continues to be dry over our house anyway. Yesterday, we spent a chunk of time putting away jam from Grandma. Mom got smart... she's now canning strawberry jam (and raspberry too!) in quart jars for us. We're used to getting pints, so we had to rearrange a bit. The kids LOVE grandma's jam. I've got a houseful of jelly snobs now, though, and they turn up their noses at anything store-bought. We also brought home some pickles. Mmmm. Very excited about my newest Review Crew product -- The Write Foundation. I'm half expecting it to arrive today. Connor is even excited about it. Clearance sales at Wal-Mart are great. I now own shorts I can wear in public ($1), and the kids each got t-shirts and other short-sleeved shirts, shorts or dresses, and the most expensive items were $3. Not sure if my local stores are clearing out the summer stuff, but at least the ones in North and South Dakota were. Considering we typically get at least one 70 degree day in January, the clothing will still get some use here. "How do you find free time? Is it okay to take time for yourself? If so, how?" is the Blog Cruise question(s) this week. And that got me thinking. Not always a good thing, LOL! One frustration I've had with the homeschooling community is that I often feel the need to apologize when I take time by myself to do something for me. A couple of weekends ago, I was thrilled to spend most of a day alone. I hung out at Starbucks, got a lot of things done, and really, truly enjoyed not having anyone touch me. This time, when I mentioned it online, I didn't have anyone go linking me up to articles about how wanting some "me-time" is totally unbiblical, or is really unnecessary, or just proves I'm selfish. But last spring when I was frustrated about the fact that I was supposed to get some time by myself and it fell through when Dale had to take a business trip, I did hear all of that. That I'm caught up in worldly values and I shouldn't want to be away from my family. I should be less focused on me and more focused on we. A whole guilt trip that I really did not need. It seems like whenever I mention looking forward to some time away from my family, I have someone telling me how they can't imagine wanting to be away from their kids, and making me feel horrible for anticipating a couple hours of time alone. So -- time for yourself -- is it okay? I say a resounding YES. If you are someone who doesn't need it, good for you. I'm jealous. But I will no longer be made to feel guilty for NEEDING some time where nobody is talking to me, and more importantly, nobody is TOUCHING me. I've discovered that I really need to be able to reclaim my personal space. I never, ever would have thought this of me years ago... but having five touchy kids and a husband... if I don't get some time without all that sensory input, I overload. And I overreact. To everything. Someone brushes against my leg and I jerk back like I've touched hot coals. It's involuntary. I get so over-touched that I grit my teeth to endure hugs from my children. I hate that. I really hate that. Fortunately, I don't get to that point often. But getting back to wanting hugs from my children isn't difficult. I just need some time to decompress. Usually that can be just me alone in the bedroom. But sometimes I really, really need a few hours of touch-free bliss. I get the idea behind the "Me-Time Myth." That we need to be looking to God to fill that hole instead of thinking about "me time" being able to fulfill us. I guess my me-time isn't something I'm doing to feel fulfilled. It is something I'm doing to truly recharge. I don't know that I've really expressed what I wanted to here (it's been a long couple days and I am exhausted... spending 18 of the last 24 hours in a car with five kids will do that to you!). I think my basic thought on time for yourself and whether it is okay does touch on the point of the "me-time myth" folks. Are you looking to me-time for fulfillment instead of looking to God? Do you find fulfillment in your role as a wife and mom? Do you come home from me-time feeling sorry for yourself because you still have dishes, laundry, and schoolwork, none of which got done while you were away? I, usually, come back from my infrequent me-time refreshed, better able to interact with my huggy children, and with a better attitude towards dishes and clutter. I don't come back feeling sorry for myself because I deserve more time away. I do believe my me-time makes me a better wife and mom. And I refuse to continue to allow other homeschoolers who either have a higher touch threshold or less touchy children make me feel guilty for enjoying the occasional time I have away from my family. We were traveling, and I did not keep very good track of what we did when. Basically, we listened to Lamentations and Ezekiel this week though. I had forgotten how much fun Ezekiel is with younger listeners. Yikes. So we are behind. I refuse to feel guilty about it though (either last week or this week), as I decided that the kids see their grandparents so infrequently that they NEED to spend time with relationships and we can catch up (or finish a couple of days "late") later. I sat down and did the math, and we have just over 25 hours of listening left. Over 20 days, that means at least 75 minutes a day gets us within minutes of finishing on time... which is only an extra 8 minutes a day... or we can continue at 67 minutes a day and finish two days late. Of course, the kids are going to be camping this weekend, so we won't be able to listen on Saturday. Ugh... I'll figure something out. As part of the Booksneeze program, I recently had the chance to read Out Live Your Life by Max Lucado. I always enjoy Lucado's perspective, so I jumped at the opportunity. This is not an easy book to read, yet Lucado's familiar style makes it easy to read. And he has made me really think, way too much, about what I see (or choose not to) around me. Some of the little challenges he throws out there are reasonably easy to skim over. Like early in the book he mentions that there are 145 million orphans in the world, and 236 million people who identify themselves as Christians in the US. And that from a numerical point of view, American Christians should be able to house every orphan in the world. Okay, well, I guarantee that I don't have room *right now* for a half-dozen orphans, or even one. That challenge doesn't tug on me at all. But then he talks about these micro-loans, going into helping people all over the world to expand their businesses. Loans in amounts like $55 for a pharmacy in Central America (or South America, now I don't remember), and I think... why am I not involved in something like this? Some really TINY amount of money completely turned this family's world around, and improved his community too. What I love about Lucado's approach is that he is telling stories from the Bible in a way that makes you really get in the heads of some of these folks. Like talking about Ananias going to see Saul in Acts 9:10... I've thought about how tough that must have been before, but I had never thought about what Ananias did -- or did not -- tell his wife about what he was up to. The challenge Lucado was making in this chapter was to think about whether or not YOU have a Saul. Someone who is so far gone that the world all says it is hopeless, that person is beyond redemption. Something I think I am going to be doing in the near future is to read through this book again. Out loud. With my 13 and 11 year olds. There are so many social justice issues in here that will certainly spark some interesting conversations, especially with the discussion guide in the back of the book to help get us started. For them especially, I really love that it is at a practical, you -- ordinary, everyday you -- can make a difference. In fact, You Were Made to Make a Difference. That's the subtitle, and that is the primary message throughout the book. So what can I do today that makes a difference? What can YOU do? According to the Math Essentials website, only 4 out of 10 eighth graders are proficient in math. By 12th grade, that drops to only 2 out of 10. Having just seen the results from last year's CSAP tests (tests mandated by Colorado for public/private schools) showing only 27% of the 8th graders in my school district are proficient in math (none are "advanced") and only 14% of 10th graders are (none of them are "advanced" either), I have to admit that this really does concern me. Especially since I know the schools have been teaching to the CSAP for at least a decade now. Well, it concerned Rick Fisher too. As a math teacher in San Jose, CA, he ended up creating Math Essentials, a workbook/DVD program to help get kids ready to tackle Algebra. Recently, he also created America's Math Teacher, a web-based version of his award-winning program. As part of the Old Schoolhouse Homeschool Crew, I got the chance to try the web-based program for 60 days. I have used part of all the current levels, and I really do like this program. Advanced Math Skills: for middle grade students. My 6th grader used this. Pre-algebra: I had my 6th grader using this level also. Algebra I: it took some convincing, but I had my 8th grader try some of this level. He's really beyond it, so he wasn't really happy with me. There are plans to expand the program to include Algebra II soon, and additional high school level math will undoubtedly follow. All the programs work basically the same way: you watch a video, and there is a worksheet for the child to practice the concept. In addition, there are some other features on the website, but we primarily used the video/worksheet functions. Thomas, doing Basic Math Skills. He was able to work through this really well. The level is perfect for him. It is definitely solidifying his ability to work the "core" math concepts. My problem for him is that it is the other stuff that trips him up -- time, calendar, measurement -- and America's Math Teacher is focused on the arithmetic that he needs for higher math. I love, though, that I am seeing that he does really have his core stuff down. One aspect for him is that we can work through this, and I can find areas where he doesn't quite get it. And THEN we can go find a textbook to use to really teach the material. It is making much more efficient use of MY teaching time. I don't have to spend time teaching him the stuff he already knows. William is going to be starting algebra in October. So I have had him working in both the Advanced Math Skills and the Pre-Algebra courses. I don't really know which I like better for him, but it has been really nice to gain the confidence that he is, in fact, ready to move to algebra at this time. I'm doing some of the same things I mentioned with Thomas -- having him view the video and do a worksheet, which takes about 20 minutes, and if he struggles (hasn't happened yet) I know to find some other materials to teach that concept. Connor completed Algebra I, has done some Algebra II and is switching gears to do Geometry this year. He did go over some of the videos in America's Math Teacher, but balked at doing the worksheets. He thought the presentation was really good, and in looking at the worksheets, he said that this would be a great review of Algebra I before starting Algebra II. There were a few areas where he commented on really liking how the information was presented. One thing to note though, is that since AMT upgraded their site, the worksheets for Algebra I have not been available. They assured me those will be linked up again soon, but as of this writing they still are not there. Overall, I would love to subscribe to this site. A subscription costs $195, and that includes everyone in your family. I'm not sure it is something I can afford to do right now, but I will be thinking about it. Meanwhile, I plan to enjoy these last few days of my subscription. And I'm seriously considering purchasing the workbook/DVD option, as I might be able to more easily swing that. I think this is a product that would be fantastic if you are pulling your child/children out of school and you aren't exactly sure what they really know with math concepts. I think this would work great as a review before moving to the next level of math. I think it would be great for someone who is struggling with math and needs to review, and master, the material they've been taught but haven't absorbed. And I think it can work great with students who "get" math so you can take them through the material, pausing to spend more time on the concepts they actually do need. That's how I'm using it. Another thing to mention is that while we didn't use this feature, there is an evaluation option which can be used either for placement or as tests of the material. Apparently, there are a lot of glitches in the evaluations at present, rendering it, well, pretty meaningless at the moment. If you are likely to use the evaluation functions of the website, I'd advise waiting awhile before subscribing. Disclaimer: As part of the TOS Homeschool Review Crew, I did receive a 60 day subscription to America's Math Teacher. The fact that I received complimentary products does not guarantee a favorable review. It does guarantee a review. A fair review. But I am not going to praise something unless I think it deserves the praise. If I don't like it, you'll hear that. And hopefully with enough detail as to why so you can decide for yourself if what I hate about it makes it perfect for your family. For more about my take on reviews, visit my blog post here. As part of the Booksneeze program, I recently had the chance to read Seeds of Turmoil by Bryant Wright. I'm not exactly sure why I requested this book, but I'm very glad I did. Subtitled The Biblical Roots of the Inevitable Crisis in the Middle East, this traces the Middle East conflict back to where it began: with Abraham and his family. The book is incredibly readable (I feared it would be hard to follow, much less understand) and Wright bounces around through history in each chapter... but it just makes so much sense, it doesn't feel choppy at all. One thing I have really grown to love about history is the inter-connectedness of events, people, choices... and this book is completely fascinating to me because Wright does a great job of showing that as well. The first section of the book (about half) is going through the historical foundations of the Middle East conflict, organized around the Biblical accounts, but bringing in lots of information from more modern history as well. The second section of the book (about 1/3) is split into three chapters, talking about the Middle East from a Jewish perspective, an Islamic perspective, and a Christian perspective. The remainder of the book includes a timeline, glossary and a discussion guide. I could not put this book down. I should be sleeping, I'll pay for it tomorrow (uhhh, I mean today). But once I started, I could not stop. I like Master Books on Facebook. First of all, I cannot believe how big Trina is -- somehow Lauren grew up, but Trina's still little in my mind. Cristi -- I LOL'd at this comment, so glad you won!! I think the SAME THING every time you post photos of Lauren!! I like Master Books on FB and saw your adorable kid's picture there, too. If I cannot get shipping information from any of these winners, I will draw again! The Old Schoolhouse is running a teacher appreciation event today only. With a $30 purchase, you get a whole bunch of goodies, including a Creation magazine, a book about the sun from Master Books, Mind Benders B1 from Critical Thinking Company, and more. Today would be the perfect day to purchase the The 2010 Schoolhouse Planner for $39... and get $35 in goodies for free! Or to purchase something else, like the Student Planners that are available next week! (Since I already own all this, I'm eying a bunch of the Planner Modules, as they are only $1 today). I want to tell you a bit about why I love my TOS Planner and think it is well worth owning. It's a pdf file, which means you only print out the forms you actually need. For instance, I don't want their Bible Reading Schedule, so I don't print it. I don't have a need for address book pages in my planner at this time, so I don't print that either. Along the same lines, the planner contains multiple versions of the same form... so I can choose to print out a format that works best for ME instead of forcing myself to get my life onto the ONE version that someone else thinks is right. Also along the same lines, some of the forms come formatted for different numbers of kids. That certainly comes in handy. Some stuff I print for one "child" (things we all do together). Some things I print for three (my three oldest tend to be doing similar things... similar enough to group 'em together on one page). Some things I print for two children (my youngest two are also doing similar things, and having them on the same form works well). There are forms in here that I would never, ever use... but in some cases, I just thought I'd never use them when I first got a TOS Planner last summer. I've realized, after seeing the forms over the past year, that it really would be helpful to keep track of some of the things I haven't been. I love being able to type information into the form and then print it out. And to save it too. So each week doesn't have to be started from scratch. That doesn't even address all the cool extras. Articles written by homeschool experts. Great lists, like one of geography terms. The best part is that I've been able to create planners for each of my kids too, by printing out certain pages that are applicable to each. But TOS will be making that even easier soon. And the new Student Planners are amazing, if I do say so myself!